So, why First Love? Our name represents everything that we are about; loving people intentionally. We show love, without judgement to everyone that walks through our door, because so much more can be achieved if you simply love first. With care and compassion, we transform lives, helping them move from crisis to living sustainably. The people we meet are not just numbers in the system, they are more than that, people with unique stories and daily struggles who deserve better. Through the love and support we give, they are able to achieve a better life. With your support, you can help us continue to transform the lives of every person we meet. To find out more, click here or on the image below to watch a 40 second video; we challenge you to show love and give this Valentine’s Day. Help us, help them. Just £10 will ensure a person receives a session with our Project Worker – to receive the love, advice and support they need. Donate today to be a part of changing lives. Thank you for making LOVE Christmas 2016 the biggest and best one yet! 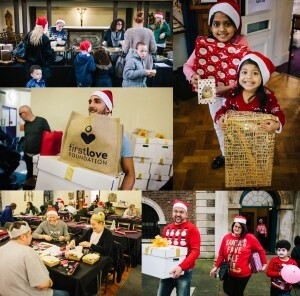 Nearly 100 local people, business, schools, churches and organisations have supported the appeal and over 100 volunteers have donated their time to ensure that EVERYONE felt loved this Christmas. Together you donated over 770 toys and collected enough food to not only fill 400 hampers but to also keep our weekly foodbank sessions running and see us into the New Year! On the 21st December we held our two LOVE Christmas events, one for families where there were crafts, entertainment, a live band, hot food and games. Then we had a special event for single adults where we enjoyed a hot meal together and a special Christmas Quiz! To continue supporting us in 2017, please consider donating money to help people go from crisis to sustainability. Just £10 could change a life. Are you able to donate some food items this week for our LOVE Christmas hampers? Organise a time to bring your donation to our warehouse. Or organise a supermarket delivery straight to our warehouse. Thank you for your support! Let’s ensure everyone feels loved this Christmas. Today is #GivingTuesday, a global day of giving after Black Friday and Cyber Monday. It’s a day to remind and encourage us to come together and do good. This Christmas, we are asking you, our friends, to help share the love with those isolated and facing crisis this season. Because after all, every person deserves to be loved and especially at Christmas time – wouldn’t you agree? Our LOVE Christmas Appeal is centred on a celebration; a wonderful opportunity for people to come together, receive food and gifts to help lessen the isolation that many face. For many, this event will be the only opportunity to celebrate the season. Give today – and let’s make this Christmas one to remember. There are 3 ways you can help, donate money, donate a gift and spread the word. Donate money. We couldn’t do this without the support from our funders and donors. Please consider donating today as a one off or set up a standing order. Just £10 could change someone’s life. Spread the word. Please help us raise support and awareness this Christmas of the isolation people face right on our doorstep. Follow us on Twitter, Instagram and Facebook to see how your support truly makes a difference. Retweet and share our posts to join our fight. Thank you for all of your support so far – we really do appreciate it. Can you imagine Christmas without food, decorations, heating or loved ones? There are so many reasons to why people will be facing crisis at Christmas time; complex issues such as homelessness, domestic violence, sickness, and benefit delay, mental health, family breakdown, and redundancy are often contributing factors. At First Love Foundation, we believe that no-one should face crisis alone, especially at Christmas time. Everybody has the right to feel loved, accepted, included, valued, appreciated and most importantly, cared for; wouldn’t you agree? The Tower Hamlets community, and beyond, have proved that they do care by supporting our big Hamper Appeal Event, now called LOVE Christmas. Over the past 4 years, we have been able to give out thousands of special festive food hampers, toys for children, and gifts for adults. How can you show you care for those facing crisis this Christmas?